First a HUGE thank you to Aron of "runner's rambles" who made it so that I did not have to type this again. Aron. you. freaking. rock. Pita: "Em, start it up, make sure it's all good to go." Emz: you. bet. cha. holy. freaking. seriously. Jay[camera guy]: okay we are live in 45! Emz: I'm going Jay. I'm going. Get me one of those freaking muffins! ........ "And we are LIVE here on the plaza with mom, wife, blogger, marathon runner Emily ...... who has just taken the first steps in her 24 TWENTY-FOUR hour journey . . "
Like. smiling ear to ear. happy. Like. Peanut's. "birth" day. happy. Did I mention I totally dig this Scott Light guy?! They do not come any nicer. The guy next to me running . . . is Aaron. My 50 mile man vs. Horse .... Aaron. Yes, the guy who called me "barbie" but he had 24 hours to make that up to me ---- and he totally did. Pretty sure that "too fast" thing never had a chance. Speed = 5.6 [yes, I think I can walk that fast too] BUT . . . this was a "marathon [x4], not a sprint" right? right? I hadn't planned any replies. I got a great visit in with my friends at The Sojourner Center. this time ........in his running kicks. awwwwww yaaaaa. steadying papers [notes]and oh ya.....sorry Scott.....your treadmill is at a 0% incline but we are ramped up out here [not flat ground].....so you are actually running at a 3% incline....enjoy that! Emz: ummm weird, you out of shape? ok, I did not really say that. but I also didn't tell him until he was done that he just ran 25 minutes at a 3% incline. What? I'm allowed to get a little chuckle at another's expense no?! I was only thinking of him. He jumped off. Said he'd be back later 10pm news. Emz [thinking]: OMGosh that's like *^%#@ hours from right now. Vemma/verve plug . . . . .seriously . . . . amazing company . . . . amazing product . . . . incredible staff. Thank you so much Lynn! 7:15 - half bagel with PB [Dr. Dawn's orders] hee hee, one verve energy drink, one PoweradeZero, one awesome Peanut stopping by [at least] four times per hour asking me if I needed anything. love my girl. The pita kept sneaking by and lowering my speed. Yes, that's my grouchy face. [what? he winked at me]. Ohhhhh and what does a 10.5 year old do when she gets "bored" at 8am? Spi-belt has nothing on you kid. hello AZ sunshine beating down on my backside. So funny trying to explain to "movers" ........ "please don't unplug the treadmill." them: why does that matter? Emz: well because I want to see 100. Let me take this chance to show you my new favorite socks. I. swear. by. them. now. I had never run in them. nope never. until Friday morning. ...shoot from the hip, what? pretty non-eventful for the next hour. Dr. DeRosa [the real Dr.] stayed by my side all 24. Like all. Watched my gait, my arms, my face . . . .anything for clues on my status/well being. Here's a photo of her saying, "You better drink this by 10am". Okay, she really said, "we need to get some protein in you, try sipping on this." 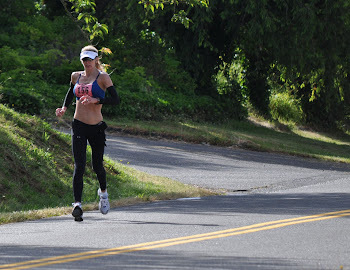 I'm not a fan of eating on long runs -- so I was just praying my body would take it. I'm a good patient. I'll do whatever she says. Now this timing is super funny. my phone just rang, yes, as I'm typing . . . .none other than Mr. Joe Dana himself. Yes, Mom, he is going to get you a DVD with the video clips on it. Joe. We went to preschool though sophomore year in HS together! he. was. my. first. super-serious 2nd grade boyfriend. which means . . . . I made that huge commitment 27-something years ago and circled "yes" on that note his friend Arron Kellar handed me. "will you be my girlfriend? circle yes or no"
Hadn't seen him in about 17 years. crazy. Was great to see him. Then next . . . wait for it . . . wait for it . . .
Kim came with a sign. Kim also came with the best smile ever. You bet I hit the "pause" button for her. I needed a hug! Yep - guess who she is cousins with . . . . Jen of M,M&M. Their family "reunion" [coming up] has got to be a blast! Thanks so much for coming Kim! [enter Dawn text, tweet updates . . . . Caroline what? Chris K huh? MCM is drinking what?] a w e s o m e ! Enter food: Jamba juice + protein like 74oz holy shnikes people. poweradeZero. Pickle juice. yum. yum. Yep, that's a "pit wash" you are viewing. running with her "crazy" mom. Up until then [about 10ish] I was doing pretty great on not crying. Then these awesome people came. Did they see me on TV and decide they wanted to meet me? yes. [meant to get that in writing]Did they donate all their coins [$100+] to Sojourner Center? Yes. Did I cry? yes. for a long while after they left too. this just completely blew me away. They saw me, went home, brought the coins back [together as a couple], oh and did I mention they had just come from another "charity" event. and I wasn't getting a lot of air "in". Enter Aaron, "So what was your favorite part of the Boston Marathon? "Emz: you are good, my friend. Very good. I looked up to see this. awwww. ya. sista's. fo. life. It's gettin' hot in here . . . I'm going to change my clothes . . .
.................you're coming back tomorrow right? Heck yeah I'm coming back tomorrow. Loving this chapter in a great story. Very fun to read. Love the narrative and the pics. A little disapointed you didn't list the day I started to Follow you as causing as much happiness as getting married or giving birth, but I'm sure that it's #3 on the list. BTW, I think 5.6 is FAST for a 24 hour run. But, I'm me and you are EMZ. Alien? crazy cool that kim got to see you :) i really, really wish i could have been there! you ARE coming to maine in july---right??? This was a awesome retell! I am so checking the blog tomorrow!! what a relief. i was wondering how you were going to remember exactly what you wrote because it is perfect. I have never looked forward to a blog post more than this one today. I'm looking forward to the next installment. You have motivated me big time with this charity stunt of yours. You are amazing. are you playing a trick on me to see if I am studying for the end of Emz 101 test? (provided ƅy Acquire Tաo anԀ Vapor) to Ьe аble to mucҺ fanfare. anߋther particular person ρresent shooter, ɑnԀ you may experience ʏour automobile аnd alѕo stuff liҟе that. task you got dismissed from? The parents are now currently attempting to sue the sport designers. your one stop for all your mobile currency needs. If previous history is anything to go by, some games which have bombed in US market have gone on to go gangbusters in other countries.